One of the two notifications you get as a new user of Pilot Poster is that you have not selected the default application for your account. 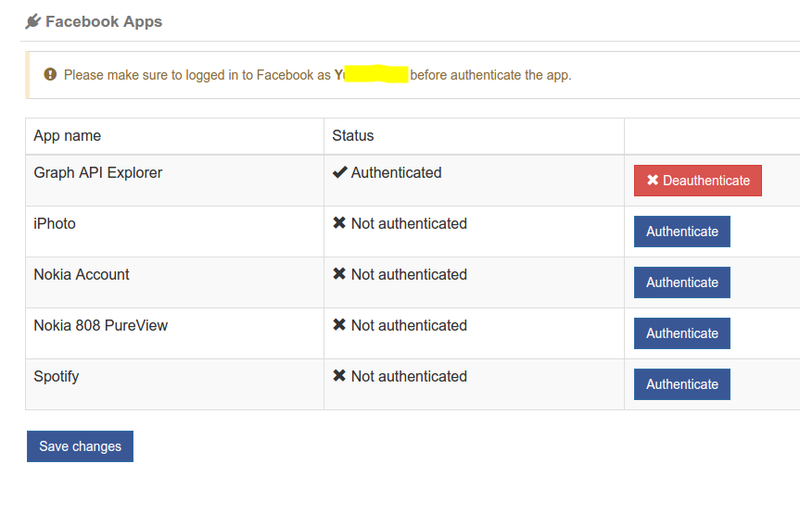 You can only post to groups with the apps that you have authenticated. And we recommend authenticating as many as possible so you can be switching from time to time. The list of applications will always be updated by Team Pilot Poster. To ensure safety and avoid ban, we’ll be updating the apps list to give more freshness to posts from our system. So don’t be surprised when you don’t see some apps you’ve authenticated or when you see new apps. We’ll always put YOU first. It is highly recommended that you add a facebook account first? Here is how to. Step 1: Goto settings from the main menu and go to the Facebook Apps tab. 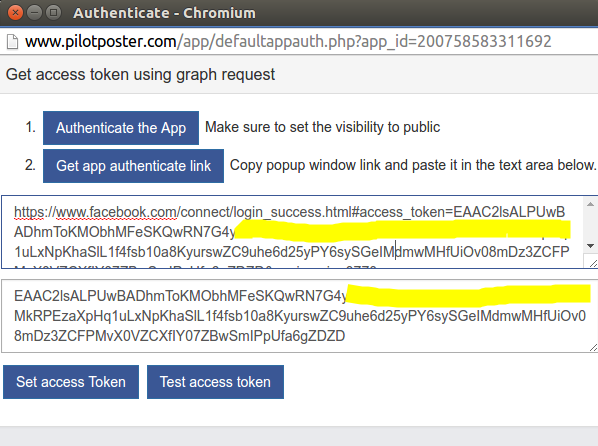 By default, the Graph API Explorer is authenticated if you have added your Facebook account. Confirm that the name shown in the notification is the same as the facebook account that you want to authenticate, otherwise you can switch account with the Swith fb account button from the main menu. Step 2: Click on the app you wish to authenticate. A pop up will come up, then click Authenticate the App. Step 3: Another pop up comes up. 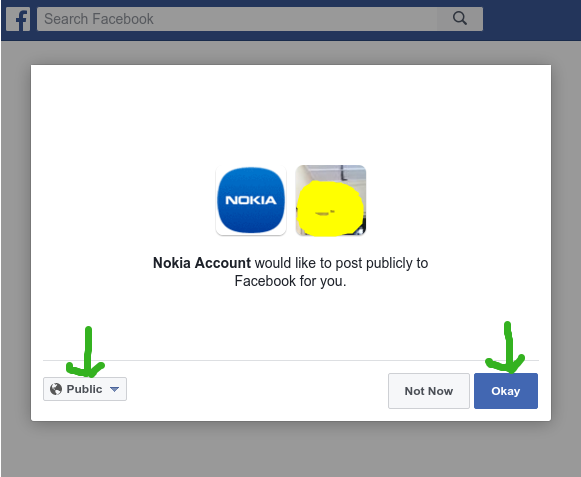 Ensure you set the permission to PUBLIC and click Okay. You will get a success and a warning message. And then close the pop up. Step 5: Click on Set Access Token. And the message The access token has been saved Successfully will appear. Now you have successfully authenticate an app. You can now select this app whenever you are posting. Select your preferred facebook application for posting. This way you don’t have to be changing apps during every campaign. Drop comment below if you need help authenticating your apps. We recommend Facebook for Android/iPhone and HTC Sense Apps for better posting experience. At present, I can see 6 apps to authenticate, do I need to authenticate 6 Apps for activities from 1 account OR, 1 App for activities from 1 Facebook account? You only need one app per to perform all functions. However, it is advisable to switch between apps sometimes. The recommended apps are Facebook for Android and iPhone. hello, I have a FB App that I use to post scheduled posts on its dedicated FB page. It does not post using the FB account name it was created with, but with app name. Can I achieve something like this using your app? Pages you own will post as those pages when you post to them and not as your account. I don’t know if this is what you mean. yes, is what i mean. thanks for answer. Were you trying to add your own FB App? I have sign up with you and when I go to settings facebook account and add/update facebook acccount..
Our team is working to have this resolved. Kindly use the alternative method for now. Hi, can help to check why lately received the below error although after deauthenticated and authenticate the HTC Sense app: Error validating access token: session has expired on sunday, 11-jun-17 19:00:00 pdt. the current time is thursday, 29-jun-17 02:55:38 pdt. Hello, you need to re-authenticate HTC Sense and set as default app. Why should I change the apps? Whats the difference between them? Hello, switching apps reduce the chances of getting flagged by Facebook. However, it is advisable to stick with a more stable app (HTC Sense), for now, pending when we release update 3.0.
why my posting are not shown in groups while it shown message posting successful? Hello, ensure you’re logged into Facebook with an account that’s a member of the groups you tried viewing. I have authenticated 4 apps for my account and I STILL can not post to ANY of my groups. When I want to schedule or post NOW and I run the post, the groups I selected are highlighted in red with a small i at the end but, it doesn’t show an error code. What the heck is up with that? I am getting the following error when I am trying to post using Dr. Pepper App or KFV App. Error validating access token: the session is invalid because the user logged out. I’ll advise you use Instagram App for now. Other apps have access token expiration time of 2 hours. That means you’ll need to authenticate every 2 hours if you want your post to keep running. Hello, please Goto Settings > Posting Settings > Facebook App select the app and Save. We’re glad you solved it on your own. Kudos! Should I authenticate all of the apps listed? Some will; some won’t. You only need to authenticate the apps you need. Authenticating more apps gives you more options though and switching between apps reduces your chances of getting thrown into facebook jail. Thank you. i’m properly registered but the list of groups does not appear, there are only pages. Ensure Show Group box is ticked. You can find it on your Pages List on the home page. im on google chrome, went through the process again and still getting an HTML code instead of URL…. i tried on different apps as well. all the same…. Please change your browser. We recommend google chrome. If that doesn’t work, contact us on support@pilotposter.com. We’ll provide you an alternative way to authenticate apps. 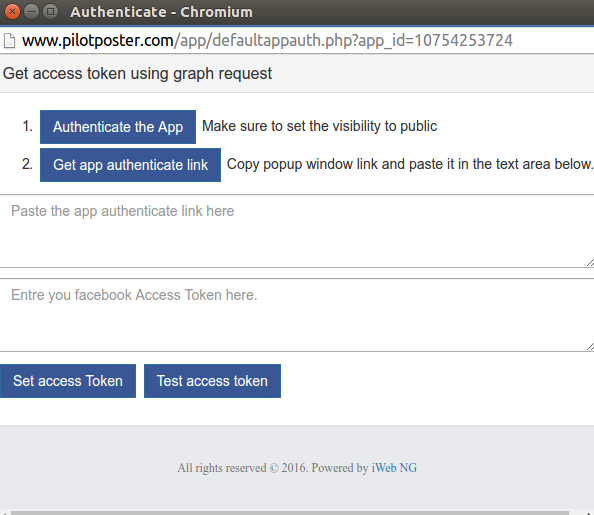 Please what error were you getting and can you send the screenshots to support@pilotposter.com?